A tribute to one of the top fighter aces of the World War II, this new full length biography appears here in its first edition. 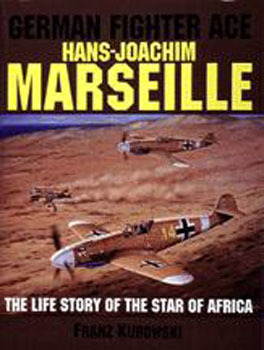 Marseilles' wartime exploits are legendary with the 158 aerial victories, including 17 in one day. He was, and still is, considered by many of the Luftwaffe aces to be the premier fighter pilot of the Luftwaffe-all before the age of twenty-three. Also chronicled is the combat life of JG 27, Marseilles' unit, and the various personalities throughout the North African campaign.